It was obvious to me it would have been inappropriate for Major League Baseball or the Tigers to let Delmon Young return from the restricted list and just take the field early this week after what reportedly happened during the early hours of Friday in New York. His suspension is significant - a week. The message is clear - ethnic slurs will not be tolerated by those in the game. 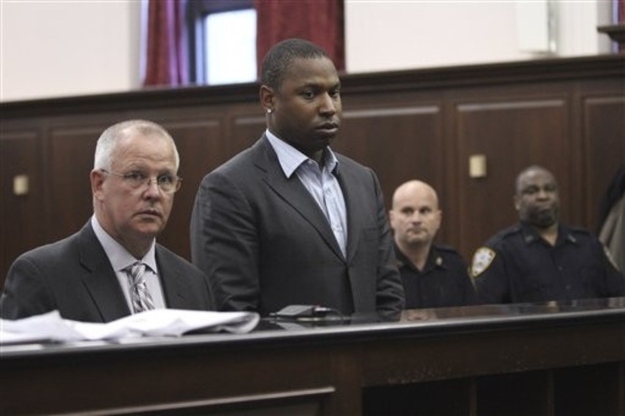 Young's reported comments were extremely insensitive toward the Jewish Community. If there was a reasonable investigation into what happened by baseball - and there is no reason to believe there was not - the suspension is appropriate. The question remains whether the Tigers should release Young. If they did, I would not have an issue with it. His contract is guaranteed and it is totally within the Tigers' right to cut their losses. I don't think he will be released, however, and I'm OK with that, too. We all know stories about people making the most of so-called "second chances." It can only be hoped Young learns from his mistakes, one way or another, and addresses any issues necessary involving anger management and alcohol abuse. While Tigers outfielder Delmon Young has the right to due process, both through baseball's system and the legal system, the Tigers also have the right to not play him. And in the aftermath of Young's reported drunken, anti-Semitic outburst in New York early Friday morning, Young should not play for the Tigers until the situation sorts itself out. It clearly has not on a number of different levels. What Young is accused of is beyond disrepectul to a large segement of Southeastern Michigan's population. It should not be as simple as, "if he is cleared to play he will play," as Tigers general manager Dave Dombrowski stated over the weekend. Why play him? So the Tigers can insult a significant portion of their fan base? Do the Tigers need a lesson in the Holocost in order to understand playing Young as soon as this week would be beyond insenstive? Look, I can't stand political correctness run amuck, but that isn't the case here. An incident like this doesn't blow over in just a few days. Nor should it. Part of this is baseball's responsibility. Young should not be cleared to play anytime soon by the commissioner's office. Part of this is the Players Association's responsibility.Their stance should be getting Young help before he comes back, if it is deemed necessary. Or clearing his name before he comes back, if he is being unfairly accused. It should not be simply just getting Young back on the field as soon as poosible. It'd be different if Young's pay was suspended during this process, but it isn't. Funny thing about taking an offensive tackle in the first round of the NFL Draft, especially in this town. There are many fans who clamor for the Lions to select one every year. Then, if the Lions actually pick one, it draws a collective shrug. That was the case in 2008 when the Lions selected Gosder Cherilus. It's happened again when they picked Iowa's Riley Reiff 23rd overall Thursday. Should the Lions have gone for defense with this pick? Not unless they do nothing to augment their secondary in Day 2 today. Trust me, there will be a run on cornerbacks to start today, likely before the Lions pick. It's their biggest need. But Reiff is a very good player, who could have easily gone in the Top 15 of this draft. He can play right tackle - and push Cherilus, whose play has been spotty, and can be groomed to replace left tackle Jeff Backus eventually. There is good value there. It's a solid pick. I think he will contribute significantly this year. The Lions were fortunate they didn't have more significant injuries on their offensive line last season because they were lacking depth there. You have to let a draft play out. This pick was just the start, and while it doesn't have a lot of "wow" appeal, I thought it was solid. I'd be surprised if Reiff doesn't have a long NFL career. 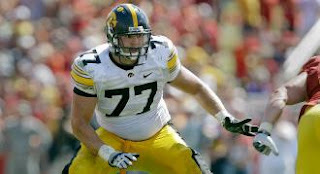 And he is an offensive tackle from Iowa taken 23rd overall in the draft. It worked out well for the Packers with Bryan Bulaga in 2010, didn't it? 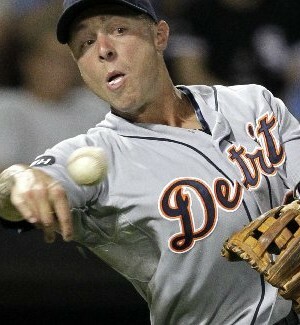 Tigers general manager Dave Dombrowski and manager Jim Leyland didn't release Brandon Inge Thursday. It was a decision that made itself. Inge was designated for reassignment last year, remember? 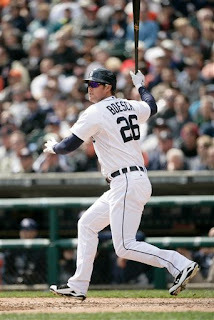 When he came back, he surprisingly contributed significantly to the Tigers in September and during the postseason. With Miguel Cabrera moving to third and doing reasonably well defensively, the Tigers having a player in Triple-A, Danny Worth, who fits what they need much better in a utility infielder role, Inge looking lost at second base and, for he most part at the plate, the handwriting was on the wall. They'll see if 6-6, 270-pound Brad Eldred, a 31-year-old minor league journeyman, can continue to hit like "Wonder Boy" in "The Natural" as he was doing at Toledo (see previous blog post), but eventually Worth will be called up - if he continues to hit well at Toledo. I agreed with the Tigers decision to carry Inge north to begin the season. He didn't have a good spring, but September in a pennant race and the postseason provided better gauges. Spring training is not a good place to get accurate evaluations on players. But to, borrow line from the TV network, April in the D, is an accurate evaluation time - and Inge showed no sign of providing the role he was needed for by the Tigers. Thursday, all that happened when Inge was released, is that sooner happened instead of later. And the Tigers are better ball club moving forward because it did. He just did fit anymore. It's understood that at 31, and soon to turn 32, the days Brad Eldred is considered a major league prospect have come and gone. He was signed strictly to help at Triple-A Toledo. The Tigers would have to add him to their 40-man roster to bring him the major leagues. If he got to the major leagues, it's highly unlikely he'd do much. He has hit only .204, with some power, but a loads of strikeouts, in three previous brief major league stints, the last in 2010. Listed at 6-foot-6 and 270 pounds, Eldred is the 4-A version of Adam Dunn. But come on, what Eldred is doing at Toledo can't be ignored. Maybe, while he is hot, the Tigers can see if the magic does translate into helping them win at the major league level, at least in the short term. Eldred is hitting .385 with 12 home runs, nine doubles and a triple in 78 at bats through the early portion of Toledo's game today. His OPS is over 1.400. It's not like the Tigers have exactly been raking lately as a whole, or have a clear-cut, every day DH. I don't know what the issues would be with the 40-man roster (somebody would have to be removed), but usually, it can manuevered. Why wouldn't it be worth a try? The Tigers series against the Texas Rangers was an early litmus test, and it revealed good and not-so-good aspects. The good: It appears they found their fifth starter in Drew Smyly. The Rangers lineup, with many really good right-handed hitters, should have been a difficult matchup for Smyly. It wasn't. He throws his off-speed pitches for strikes early in the count, which makes his fastball much more effective later in the count. Also, he displayed the propensity to make an "out" pitch when needed. The Tigers bullpen isn't awful, but it is not as good as the Rangers. It could be a problem if they meet in October. 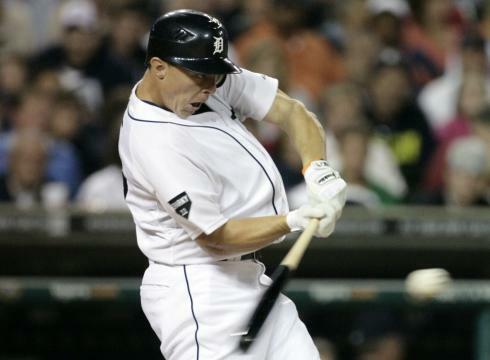 Brandon Inge's performance Saturday, both offensively or defensively, was alarming. The Tigers face two left-handers this week, Jason Vargas of the Mariners Tuesday, and C.C. Sabathia of the Yankees Sunday. Those figure to be the two games Inge starts. He is 1-for-6 vs. Vargas and is hitting .217 lifetime against Sabathia. Rick Porcello's start Saturday was disappointing, but also misleading. 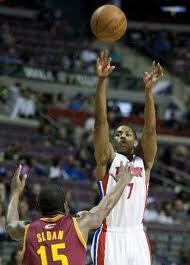 He received little support defensively. It was going to a rough outing no matter what, but could have been more presentable with some defensive support. A couple other things. The series might have gone differently if Doug Fister started one of the games rather than Adam Wilk. The Tigers need to do a better job of running the bases. They can't afford to run themselves out of innings against the better teams. Miguel Cabrera, in particular, must run the bases better. There is concern about the Tigers' lack of offense in the last week, but rest assured, eventually they will post big numbers. 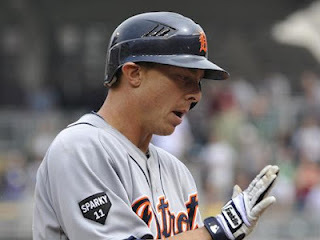 I believed the Tigers made the right decision by taking Brandon Inge north to begin the season. The reason? Even though he had a poor spring statistically, he did perform well last September as the Tigers raced to the American League Central title, and during the pressure of the postseason vs. the Yankees and the Rangers. But there can no better evaluation time than a Saturday day-night doubleheader at Comerica Park against the two-time defending American League champion Texas Rangers. Inge made two bad mistakes defensively at second base. 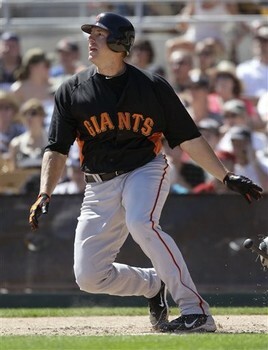 He has also struggled mightily at the plate, other han a very big home run at Kansas City last week. He hit one of those early last season, too, but the slump still went on and on. In truth, the Tigers can't go on for an extended period with Inge in his current role. He doesn't fit it as well as Danny Worth, an ideal utility infielder for the Tigers, who is off to a hot start at Triple-A Toledo (he is hitting .343 with a 1.082 OPS). 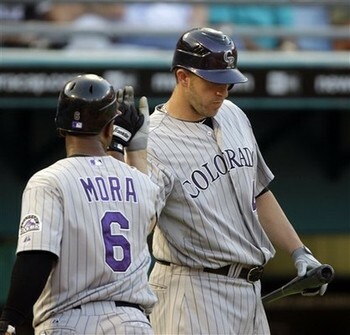 Worth would be the Tigers' best second baseman and shortstop defensively. He is probably Inge's equal defensively at third base. Miguel Cabrera is playing adequately at third base defensively, so the need for Inge as insurance there isn't urgent. The booing of Inge is misguided, but the frustration behind it is understandable. More and more, the handwriting is on the wall regarding Inge. The only way he can change it is to start hitting. And not two weeks from now. Or a month from now. Right now. Otherwise there is no way the Tigers can justify his place on the team ahead of Worth. Isn't that the message that came out of the first game of the Tigers' four-game weekend series with the Rangers? It was the first game not having Doug Fister really hurt the Tigers. A left-hander like Adam Wilk, who doesn't throw hard, was like placing meat in the lions cage at the zoo against that batting order. The Rangers lineup, top-to-bottom, has less holes than the Tigers. They also have much more speed, are superior defensively and have a considerably better bullpen. The Tigers edge is at the top end of their ball club. Their best three players - Justin Verlander, Miguel Cabrera and Prince Fielder - are better than any on the Rangers. But it is not like the Rangers don't have star power, though. If the Tigers are going to beat the Rangers now - or in October - their Big Three will have to come through for them. 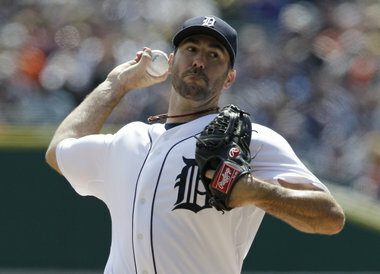 Verlander's start Saturday is the key to the series. Rick Porcello's matches up well against the Rangers, if his two-seam fastball is working, tonight. If lefty Drew Smyly does well Sunday against the Rangers with all that right-handed thunder, you know he's going to very good. Can you imagine if the Rangers had signed Fielder? They should have gone all out to do so. They would be absolutely devastating, and the Rangers had the money land him because of their TV contract. Honestly, I don't get the "Yu Darvish is baseball's next great pitcher" thing. He was solid, though, especially given a wide strike zone, Thursday. There are a lot of things to like about Mark Dantonio as Michigan State's football coach. His team plays with strong fundamentals. The Spartans' basic schemes both offensively and defensively are based on sound principles. Yet, Dantonio is, at times, a daring gambler who is not afraid to make a play call. When State gets players in its program, they generally improve year-to-year. And, this is the most important thing, Dantonio doesn't play the traditional MSU coaching card and threaten to leave. But what Dantonio does best is embrace the Michigan rivalry. Ah, embrace it is too nice a word. He kind of slaps it. If he is at a coaching clinic and does not like what the Michigan assistant is saying, he comes right out and says so. If a Michigan football player is disrespectful to MSU, he's not afraid to do something like put his hand out in front of him, oh, about 5 feet from the ground mockingly. 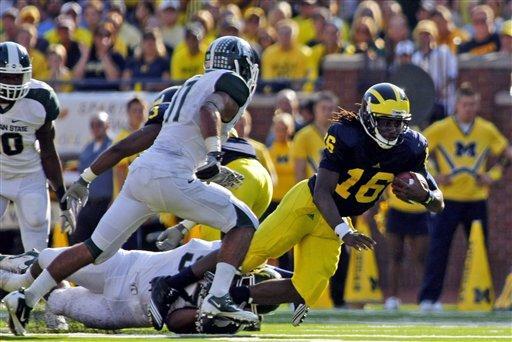 Michigan had an excellent season in 2011 and Brady Hoke is a terrific coach. Dantonio's response as quoted by ESPN.com - about as high profile place as you could make such a statement - "We've beat Michigan the last four years. So where's the threat?" Don't get me wrong. Hoke is doing well at Michigan. But the notion the Spartans are just going to give back this state in football is a mistaken one. The Wolverines will have to take it back. They only made so much progress last season. It was hardly complete. Michigan always wins on recruiting day, but a couple of MSU's three-star recruits, Jerel Worthy and Kirk Cousins, will be selected early in the NFL Draft. Michigan lost key parts off its offensive line. MSU's defensive line is a strength. Yes, William Gohlston is still there and 6-7, 280 pounds and real mean on the football field. Andrew Maxwell was a highly-regarded QB coming out of high school and has done nothing to dismiss that idea since coming to MSU. His only issue was being behind Cousins. He will do well. Michigan State, not the Wolverines, won the division last year. Michigan does not get any extra credit points for MSU's really tight loss to Wisconsin in the Big Ten title game. And so Michigan was in a BCS bowl game and not MSU? What was the more prestigious victory - one over an ACC team or one over a team that played in the SEC title game? It's not splitting hairs about which program is better entering this season. That why is was a joke Hoke was named Big Ten Coach of the Year over Dantonio last season. Which team won head-to-head? Which team has accomplished more recently? While Michigan has made strides, it's anything but a given it will change moving ahead. Dantonio's comments seemed to indicate the Spartans aren't exactly quaking in their boots at thought of Michigan's uprising. They shouldn't be. This isn't 2002. It's 2012. A different time for the Spartans and the Wolverines and their rivalry. One Dantonio, to his credit, isn't shying away from. -The Red Wings' wide edge in shots on goal is misleading. They are throwing a lot of soft shots on Nashville goalie Pekka Rinne. It's like picking apples for the guy. The shots aren't along the ice or with any sort of screen. They are easy saves for him. - Nashville is clogging up every aspect of this game. Only a goal will loosen up the tightness of it for the Red Wings. Obviously, that's easier said than done. - Realizing this might be the last home game of his career, I've made it a point to notice each of Nicklas Lidstrom's shifts tonight. With all due respect to Bobby Orr and others, I think Lidstrom is the greatest defenseman of all time. - The Red Wings fourth line is not getting much ice time, but has actually been threatening when given the opportunity. Cory Emmerton is surprisingly effective. - Finally, the Red Wings played with the urgency at the start of a game they have been displaying at the end of the third period while in the midst of frantic comebacks. It put the crowd totally into this game. You can tell they want to believe in this version of the Red Wings, which wasn't easy following Sunday's loss. 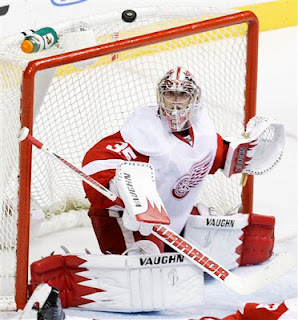 - The Red Wings must do a better job of screening the goalie on the power play. They are making it too easy for Nashville's Pekka Rinne. - Danny Cleary has to score that goal. Windows of opportunity are going to close quickly with Rinne in net. He is getting stronger as this series goes along. - You can just tell that Nashville's Alexander Radulov loves himself some, well, Alexander Radulov. Talented player, though. - I know Todd Bertuzzi's penalty was about trying to create room on the ice for one of his teammates, but it still has to fall under the category of unnecessary. Ditto for the one on Pavel Datsyuk, which negated a power play opportunity for the Red Wings. The NFL Draft is always more perplexing for a team selecting later rather than sooner. For one thing, their needs don't fall under the category of "everything," which by the way, has described the Lions' drafts of the past. Not anymore. The Lions have an excellent offense now - one of the best in the NFL. The Lions defense is suspect. They NEED to draft defensive players in the early rounds. Taking offensive players would be counterproductive. Problem is, at No. 23 overall in the first round, the best players that might be available, cornerbacks Jarnois Jenkins (North Alabama, Florida) and Dre Kirkpartick (Alabama) have marijuana-related offenses in their past. The Lions have had an off-season in which three of their five picks from the last draft were charged with marijuana possession - Nick Fairley, Mikel Leshoure and Johnny Culbreath. Jenkins is particularly intriguing. He is potentially not only a good player, but a great player. In terms of ability, he is one of the top three non-quarterbacks in this draft. I love how these mock drafts have Jenkins lingering at 24th overall. It will be like taunting the Lions if he is there. Jenkins could be another Darrelle Revis. He is a pure cover corner. Kirkpatrick is big and physical, but not nearly as capable of shutting down a receiver in one-on-one coverage. But Jenkins' off-the-field problems run pretty deep, including his admission he continued to smoke pot at North Alabama after being booted out of Florida. I see the Lions passing on both these guys. The next tier of cornerbacks is good. Central Florida's Josh Robinson, who Michigan wanted badly out of high school, could star in the league. Dwight "Bill" Bentley from Louisiana Lafayette is a very good player with his height being the only concern. Robinson and Bentley have exceptional speed. Bentley, by the way, was Jenkins' teammate in high school. It's highly unlikely Robinson will be there in the second round for the Lions. Bentley might, although there do tend to be runs late in the first round and early in the second on cornerbacks in many drafts. It's just the value of the position. 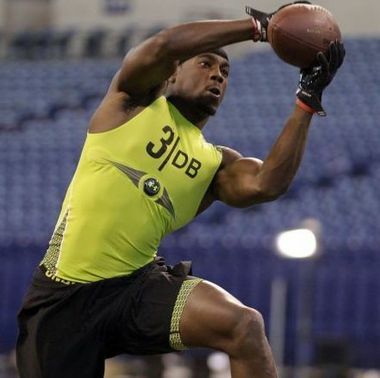 Another intiguing issue in this draft will be where Alabama safety Mark Barron is selected. He is a superior player - ideal for the Lions. He should be gone by the time the Lions select, but safeties are often undervalued - and drop. Yet, look at the best defenses the last decade - many of them have a great safety. 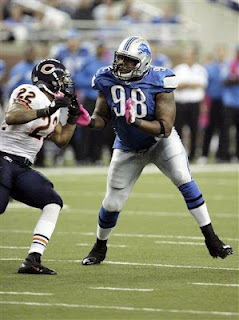 Barron and Louis Delmas together would markedly benefit the Lions cornerbacks. The Lions still have needs on offense. Running back. Offensive line depth, including a left tackle and center to groom as eventual replacements for Jeff Backus and Dominic Raiola. But they are not glaring needs, like secondary. This is a replay of my livestream video chat today. Jeff Kuehn and I do this every Monday for about 45 minutes starting between 12:30 and 1. A "Cover it Live" chat is set up, only instead of typing back we speak directly to you. I give out a sports book from my personal library every week to somebody with a question/comment. Check it out. Tough break for the Red Wings, but time had expired off the clock before the puck went in the net. It was the right call. - That was a classic a Pavel Datysuk goal, one that will be replayed for many years, perhaps even at his Hall of Fame induction. That's what he is best known for right, takeaways and sweet hands? Roman Josi was like hockey's version of somebody getting dunked on by Blake Griffin. Definitely, that goal could prove to be a momentum changer. - It was almost as if Red Wings' defenseman Brad Stuart didn't expect Predators defenseman Kevin Klein to make that type of move in open ice. Nor did goalie Jimmy Howard expect that type of sniper's shot from him. It was definitely a moment when the Red Wings let their guard down. A costly moment, too. 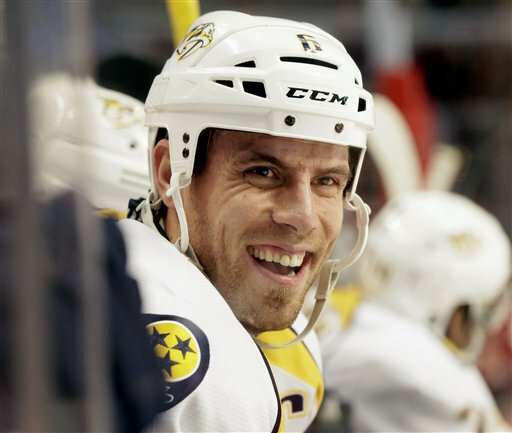 Klein had 4 goals and was minus 8 for the Preds this season. He is no Bobby Orr, but he looked like it on that play. And, no, he is no relation to the actor, who spells his last name K-L-I-N-E.
- I like Kyle Quincey as a player and do think he will do well for the Red Wings in the future. But since being acquired, he had taken too many unnecessary penalties. The Red Wings were fortunate they didn't go down 3-0 when he put his team in a 5-on-3 penalty kill situation. - The Red Wings, surprisingly, didn't display much jump early in the first period. The play was all in their own end. - The penalty call on Drew Miller for goaltender inference was a joke. So a player can't go hard to the net in open ice anymore? The Predators were handed a power play opportunity they didn't deserve. To their credit, though, the Preds took advantage of it. Also, the hooking call on Niklas Kronwall was ticky tack. - Composite sticks are dreadful sometimes. How can they break just from deflecting a shot? That is happening more and more, and it's alarming. Had Pavel Datsyuk's stick not broken, it's unlikely the Preds would have scored Shea Weber's goal. - The Red Wings' forecheck was more effective late in the period. - The crowd is more into this game than I've seen for a playoff home opener in awhile at Joe Louis Arena. 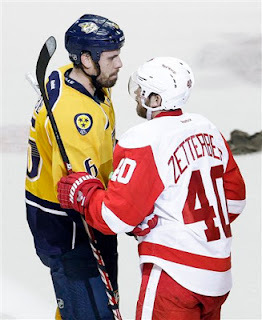 It's probably because the Red Wings opened on the road , and the competitiveness of the series has already been established, especially in the aftermath of Weber's hit on Henrik Zetterberg, and the subsequent fight between Weber and Todd Bertuzzi. Maybe, too, it's because the Red Wings are in a different role this time, as an underdog, and they rallying behind them. A lot of attention is put on the Tigers high-priced, big guns, but they have done a good job of developing players. Outfielder Brennan Boesch was a third-round draft choice, who has become a major league regular. Alex Avila was a fifth-round pick and an All Star last season. 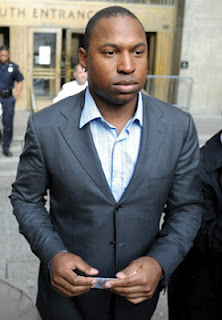 It would not be a surprise if he is again in 2012. Left-hander Drew Smyly did well for a first major league start, given his limited minor league experience, and the strong Tampa Bay lineup he faced Thursday. Andy Dirks, Duane Below and Danny Worth have not been overmatched in the major leagues. All the above have been Tigers’ non first-round draft choices since 2006. And that’s before getting to the players the Tigers traded away to acquire veteran talent. There was a time when the Tigers prospects would consistently arrive in the major leagues with a deer-in-the-headlines look - and not be able to perform. That’s changed. Their player development system is doing a better job of teaching them how to play the game. Not just with top prospects, but others who are able to contribute for periods when necessary over the course of these marathon seasons. It’s an underrated factor why the Tigers have become one of the better teams in baseball. 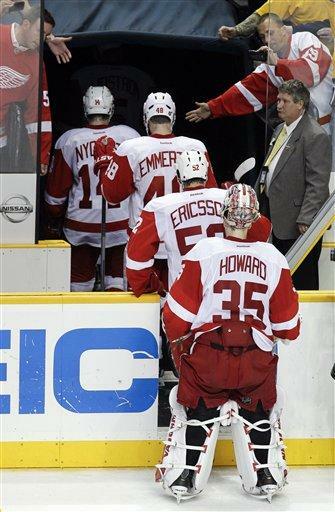 - The Red Wings displayed both will and skill to get back into this game. Henrik Zetterberg played particularly well in the second period, not only scoring the goal, but by carrying the puck and on the penalty kill. Nashville's has the big guns on defense, but their forwards disappeared. - The referees went from absurd to ridiculous in the second period. The call on Jonthan Ericsson was particularly awful. It's been awful both ways. - When he was tested, Pekka Rinna didn't exactly look solid in goal for the Predators. Problem is, the Red Wings aren't testing him enough. It's tough, though, to find any flow in this game when it's a constant battle of speciality teams. - The Red Wings penaly kill has been the first star of this game so far. 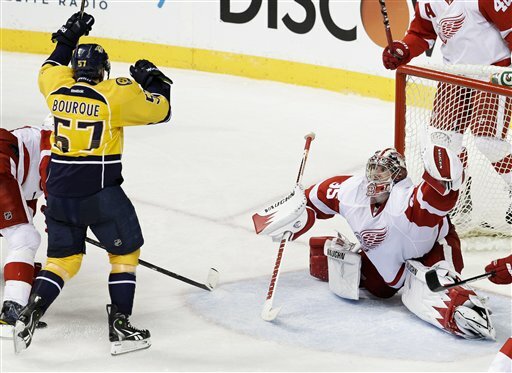 - I know the puck was deflected on Nashville's second goal, but Jimmy Howard needed to find a way to stop it. He's played pretty well overall. - There are too many penalties being called. The only real one was the hit on Ian White. And that should have been a major. The officiating in the NHL continues to be a joke. Let them play. - Massively big 5-on-3 penalty kill by the Red Wings. It could change the momentum of the game. Will there be makeup calls for that. So far? it's like the officials are handing this game to the Preds on a platter. The Preds are pretty good. They don't need the help. - The Red Wings still look confused on the power play. They are moving the puck well enough, but it's like they are passing when they should shoot, and shooting when they pass. Nashville's power play is way more together. - If Pavel Datsyuk and Henrik Zetterberg aren't more theatening, neither will be the Red Wings in their totality. They are supposed to be among the best players in the world. They need to play like it. 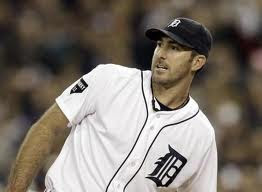 Did Jim Leyland make the right decision today by leaving Justin Verlander in the game to start the ninth inning? No. The results say it all. Verlander wasn't able to hold the lead. The Tigers lost 4-2 to Tampa Bay. Same with opening day, when Leyland pulled Verlander for Jose Valverde, and the Tigers let go of a 2-0 lead - and were fortunate to win in the bottom half of the ninth. Two decisions. Two decisions that didn't prove to be correct by Leyland. But how much criticism should Leyland be subjected for them? Obviously some, but each instance was the ultimate, "damned if you do, and don't if you don't" circumstance. It would be disingenuous of me to second-guess Leyland on either decision because I would have done the same in each situation. Verlander had thrown 105 pitches on opening day. It was enough. Today, I would have left Verlander in to start the ninth. His pitch count was low enough and he was in total and complete control of the Rays' hitters to that point. The only thing I would have done differently is pull him out of the game sooner once Tampa Bay started rallying. But it's understandable why Leyland left him in. Verlander is the best pitcher in baseball, and his chances of succeeding with runners on base in that situation were at least equal to those of anyone in the bullpen, including Valverde. Also, Daniel Schlereth does not command the baseball well enough to pitch in game-deciding circumstance. Anybody surprised by that walk? It should be understood that baseball is ultimate bottom line business. It didn't work. Rationale thinking about decisions that didn't work don't win games. The Tigers blew it today, and it was the collective effort of their pitching staff, which it can't be said was properly handled by the manager. He is paid to be right - and he wasn't. 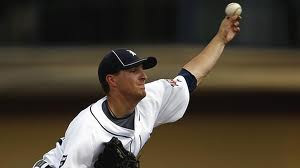 The depth of the Tigers starting pitching in their minor league system is being tested because Duane Below has already had to do a lot out of the bullpen early this season, Doug Fister is on the disabled list, Jacob Turner ailing and Andrew Oliver and Casey Crosby struggling. So it's on to Adam Wilk. Want a comparable for Wilk? Luke French, who did OK for the Tigers for a stint in 2009. He has since pitched more in the major leagues with Seattle with a high ERA and WHIP, but also with some effectiveness at times. Wilk is a left-hander with below average velocity and no real out pitch for major league hitters. He does command the baseball well, though, displays poise and a good feel for pitching. It would be surprising if walks a lot of hitters like Oliver has during his major league auditions. Wilk's stuff is not as good as that of Below, for example, but he might be able to get the Tigers through four or five innings or so in a start or two, which is all they need at this stage. Freedom of speech is a right of every citizen in this country. What's often dismissed about it is the freedom others similarly have to react with their own thoughts to what somebody has said. Ozzie Guillen made his own bed. His statement that he "loves" Fidel Castro, especially given he is the manager of the Marlins, in a city, Miami, so many people have gone to escape the oppression of Castro's Cuba, is deplorable. When I heard the statement, I thought of Alex Sanchez, the former Tigers outfielder, and talking to him about his three days at sea during which he feared dying at 18 in open water on a makeshift raft trying to get this country from Cuba. Sanchez spent 16 months in a detention camp after being rescued by the Coast Guard, before he was allowed his freedom here. The outrage in the Cuban community is not an overreaction. It is justified. Guillen couldn't have said anything worse in a town where Castro is viewed like Hitler. Guillen has always been a loose cannon, but he is a manager that is generally respected in the game. I asked Jim Leyland about him a year or two ago and he said, "Ozzie is dumb like a fox." I agree about his ability as a baseball manager. He is a good manager. His antics are usually funny. Generally, he is likable, but he badly misspoke on this issue. The five-game suspension by the Marlins is justified. His apology was appropriately contrite, but the wound he opened is wide in the community he now resides. It will take a long time to heal. For many, it will never. Thing about free speech and thought, it's their right, too. The Tigers' season-opening weekend was stunningly successful. Their lineup is exceptional. Boston's pitching staff noticeably labored against the Tigers lineup. Miguel Cabrera, with Prince Fielder hitting behind him, saw a lot of fastballs he didn't see even last season when Victor Martinez was hitting behind him. He crushed them, too. Austin Jackson looks like a much different - and better - hitter. Alex Avila is improving, too, not taking a step back, which some pundits had anticipated. A sweep in the opening series doesn't make a season, but it shouldn't be understated, either, especially by a strong contender. Often a fast start builds momentum that leads to a runaway division winner, particularly a club that already appeared far ahead of its competition - like the Tigers in the American League Central. But here's a word of caution, and it is not meant as rain on the parade, just an observation: The pitching staff did not perform well. Max Scherzer's outing was alarmingly bad. Doug Fister's injury has depleted the strength of the rotation for awhile. The back end of the bullpen, which was so good the second half of last season, was surprising inept against the Red Sox. Now, the Red Sox have a strong lineup, but suffice to say the Tigers can't expect comeback victories consistently. They must pitch better than they did out of the bullpen Friday, and both starting and relief, on Sunday, if they are going to pull away easily with the AL Central title. These developments put a lot more pressure on Rick Porcello and Drew Smyly, especially after the latter struggled mightily in his Triple-A tuneup start. I'm sure the preferred option for the Red Wings in the opening round of the playoffs is getting the fourth seed in the Western Conference and meeting Nashville - with the home ice edge. They will play very hard Saturday and celebrate mightily if they beat Chicago in the season finale at Joe Louis Arena. The only way the Red Wings will get home ice in the first round is to get two points in their season finale, and Nashville none in a late Saturday game at Colorado. Other scenarios have the Red Wings dropping to a fifth seed and still playing Nashville (if the Wings win Saturday and Preds get a point, as an example). Or having Chicago vault past them by winning, taking the higher seed and the Red Wings dropping to sixth, which, oddly, is their best option. That's because the Pacific Division champion gets the third seed. And it will be either Phoenix, San Jose or Los Angeles. The Red Wings have beaten Phoenix in the opening round the last two years. Ray Whitney has been the Coyotes best player, and Mike Smith is their goalie. They stay competitive because of tight checking. Phoenix is clearly the Red Wings best option for the opening round. San Jose has struggled this season, but remains daunting. They have knocked the Red Wings out of the playoffs the last two seasons in the Western Conference semifinals, still have one of the best power play units in hockey and a Cup-winning goalie in Antti Niemi. I'm sure Joe Pavelski is licking his chops at the prospect of facing the Red Wings. It's like NHL has a mandate he must score a goal every time the Sharks play Detroit. And it must be an important one. The Kings have played exceptional hockey down the stretch, and their goalie, Jonathan Quick, is on the verge of becoming the league's next great player. Anze Kopitar is one of the NHL's best forwards, if under-appreciated players. Since making a deadline trade with Columbus that sent former University of Michigan star defenseman Jack Johnson to Columbus for goal scorer Jeff Carter, the Kings have taken off. Oddly, it hasn't been because of Carter, who had some big seasons in Philadelphia, but was a disaster in Columbus. He hasn't even played lately because of an ankle injury. For the Kings, it's all about Quick and Kopitar, and Drew Doughty, a gifted defenseman, but one who has struggled to live up to the hype after starring at such a young age for Canada in the 2010 Olympics. Nashville, home ice edge or not, is the worst option. These are not the old Predators the Red Wings ousted rather easily in the past. They won a playoffs series last year and pushed Vancouver in the second round. Pekka Rinne is a great goalie. The Preds have a tremendous power play, and Shea Weber and Ryan Suter are Superman and Green Lantern along the blue line. Honestly, the Preds might be the best team in the Western Conference. - Justin Verlander's brilliance wasn't in his overpowering fastball, but the command he had of all his pitches. His feel for pitching is matching his so-called "stuff." It's an amazing combination. It's just too bad he didn't get "W" for the effort. - Jose Valverde has been a good closer for a long time, but it's probable he is not going to as effective this season as he was the second half of last season when he pitched the best baseball of his career. 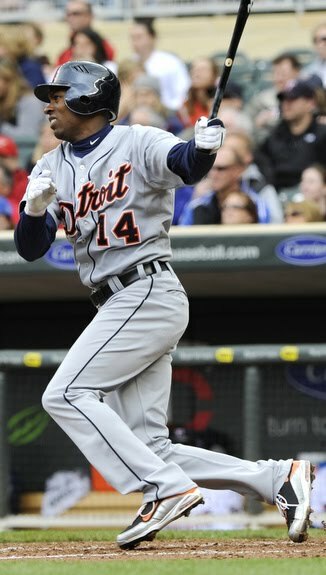 - Getting rid of his leg kick evidently was the best thing Austin Jackson could have possibly done. He looked like a completely different hitter. Even his outs were good at bats. - That was a great ball game. So many times on opening day, the game doesn't match the excitement surrounding it. Not Thursday. The audio of former New Orleans Saints defensive coordinator Gregg Williams urging his team to hunt and hurt players on the San Francisco 49ers is shocking, even knowing what we already knew about the Saints' so-called bounty system. Putting the focus on injurying somebody's brain, especially at a time when it has been so well-documented how the lives of NFL players, past and present, have been severely hindered by brain trauma, is deplorable. So is everything else about Williams' rant. What I don't understand is why there is so much emphasis on how the audio was acquired, and why that is bothering people. If NFL coaches are talking like that behind closed doors, I'm glad somebody had the guts to release something like this audio so it can stop. Players who are outraged by this violation of the locker room are missing the point. They are the victims of people like Gregg Williams, not those who have brought this issue to light. Opening day is always a big deal in this town, but it is more intriguing this year for a couple reasons. First of all, it won't be one and done. For a number of years, opening day was the only day a lot of sports fans in this area paid attention to the Tigers. That was especially true when the Pistons and Red Wings were both threats to win world titles. Now the Tigers have gone to the head of that list of expectations. Another is the Red Sox are the opposition. My prediction is the Tigers will reach the World Series and lose to the Phillies. I was originally going to pick the Red Sox to win the American League pennant. But with closer Andrew Bailey injured, I'm not so sure about the Red Sox. Boston still has great stars. Their lineup can match the Tigers, and is stronger at the top with Jacoby Ellsbury and Dustin Pedroia as the table setters. This should just be a fun game today, but an excellent opening series. There are three terrific pitching matchups. My sleeper team in the AL this season is Toronto. I expect the Yankees to struggle to win 90 games. The Michael Pineda trade, at least so far, appears to be recipe for disaster. Yeah. Yeah. Yeah. I am aware of the Angels and Rangers are formidible. The Tigers do play the Angels 10 times this season, by way - are during the second half of the season. Prediction for the loudest cheer or boo today: Loudest cheer: The first time Miguel Cabrera fields a ground ball throws a runner out a first base. The loudest boo: If he makes an error. Oh, and Prince Fielder will be very warmly welcomed. 1. Austin Jackson - He had a horrible April at the plate last season before bouncing back. But still, he was far from the ideal leadoff hitter. If his on-base percentage rises and strikeouts drop, Jackson's stats as a so-called table setter will be off the charts. If he doesn't, there will be a lot of fretting about how the Tigers lack a table setter. And such talk will be justified. 2. Miguel Cabrera - His move to third base will now become a primary focus. If he is just OK, there will be tons praise for him. If he makes countless errors or obviously lacks range, it will become the major story surrounding the club. 3. Rick Porcello - He's been either really good or really bad. His inconsistency has been maddening. If he doesn't perform well to start the season, his youth will not longer be considered the crutch it once was. If he performs well, there could be talk about how the Tigers not only have the best starting pitching rotation in baseball, but one of the best of this generation. 4. Jhonny Peralta and Alex Avila - I put them in the same category, even though they are very different players at varied stages of their careers. Why? They both play premium position and greatly exceeded expectations in 2011. Can they do it again? While it is understood Brandon Inge's only real chance for success as a major league hitter at this point is vs. left handed pitching, platooning him at second base with another right-handed hitter, Ryan Raburn, does not make sense. Inge must be a significant contributor at the plate to justify his spot. He can't be floundering around with an OPS below .700 or something ridiculous. That is unless Miguel Cabrera does not perform well defensively at third base and the Tigers go to a Plan B. Another factor will be how Danny Worth performs at Toledo. How well will he hit? If he is a reasonably effective hitter and Inge not impactfully productive, Worth fits the puzzle better. Frankly, this is not a good infield defensively, and Worth is a plus fielder. Raburn has earned his reputation for bad starts - another issue. Ramon Santiago is still there to come to the rescue. The way this is setup does allow manager Jim Leyland to see exactly what he has and adjust. The downside: The Tigers early season schedule is not easy. They see a lot of top teams early, albeit at home. Experimenting could be precarious. 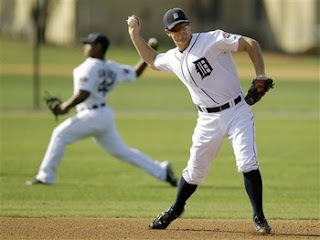 - If Danny Worth were to make the opening day club instead of Inge, it would be understandable. He can play shortstop and is the Tigers only above-average defender among their infielders. He is more versatile and fits a need for the Tigers better than Inge at this stage. He could share third base with Donald Kelly if third base doesn't work out for Miguel Cabrera. The Tigers could also acquire another version of Wilson Betemit if necessary. If a determination is made that Inge, 34 and about to turn 35, isn't the same player he once was, so be it. - The blood thirst a growing number of fans and some media have toward Inge's potential demise is unfounded. He had several good seasons for the Tigers. Their view of his performance was skewed by the first half of last season when he was awful. He had an OPS over .700 in 2010 and 2009, and good seasons in the middle of his career in 2004, 2005 and 2006. His career numbers have gone on a curve - a very poor batting average his first couple seasons, and then he hit bottom last year. His career OPS, for example, is considerably higher than that of Ramon Santiago, a player many Tiger fans seem to think is vastly underrated. - I've heard the term "cancer in clubhouse" in regard to Inge lately. It's just not true. He has often spoken with self-confidence, which I explained in a column I wrote earlier this year http://bit.ly/yDTCd1 but hasn't thrown teammates under the bus or been a problem for his manager or team management in any way.